Seamus Heaney once described a thatcher working with his hands as..
‘…for pinning down his world, handful by handful. ‘Thatching is not a job. It is a way of life: a thatcher’s life’ says Liam Broderick who has worked as a thatcher in Ireland for the last 25 years. 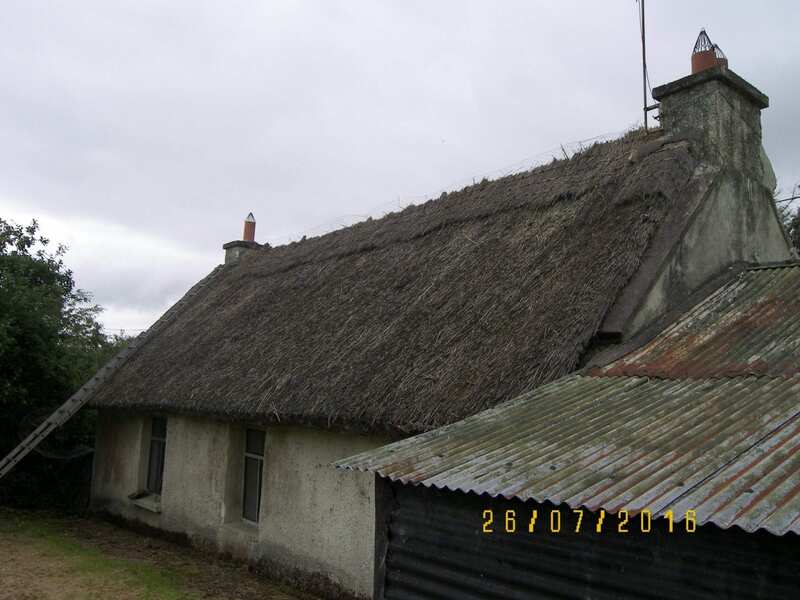 Last year, he was employed by Irish Landmark to save the roof of a small cottage in Co. Cork. An epic journey that remarkably starts with a bundle of Turkish water reed. It is Turkish water reed, rather than straw, which is the preferred material of choice for Liam; it sounds quite exotic but Liam simply places an order and it is delivered directly to the port in Cork. The reed is particularly well suited to the damp Irish climate and is a more durable and water-resistant material than straw. Liam explains that he is so used to his work that he will know exactly how many bundles of reed will be required by simply looking at the scale of the job. The before and after photographs speak for themselves and are testament to the first breaths of a new life that Liam has restored to the Mall. 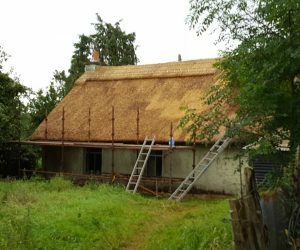 The next phase of the project will occur when funding has been secured but the thatched roof has been an essential step in the restoration process. The future for The Mall holds a special and personal resonance for Liam. Having known both Mick and Molly Hennessy, the previous occupiers of the cottage, Liam recalls how in the past he would arrive to work at the cottage and Molly would be straight out to offer breakfast with a boiled egg and toast ready to go. Liam explains how after a home owner dies and the house is left derelict, the building deteriorates and ‘it will not be long before the roof dies too’. Liam is conscious about the next phase of restoration for The Mall being dependent on securing future financial funding but knows that his work on the roof is an important step to save it. ‘Houses are not an ornament, they are to be lived in and are a place to share good times’. By thatching the cottage, Liam felt like the lives of Mick and Molly were being honoured and he believes that ‘once you close up a house it loses its spirit and it becomes an empty vessel’. You get the very real sense when talking to Liam, that he sees these houses as having an “aliveness” to them – they breathe, they have a soul, they absorb memories and through his work he helps these houses to live on beyond their original form. Recently, there has been plenty literary discussion about the merits of carrying out meaningful work practice. The American philosopher Matthew Crawford’s book, The Case for Working With Your Hands: Or Why Office Work is Bad for Us and Fixing Things Feels Good, describes how the skills associated with working a trade hold the key by which to unlock day-to-day satisfaction. Crawford lobbies against a knowledge only based workforce and argues that office work will not suit everyone. Incorporating the weight of great minds such as Aristotle, Marx and Heidegger, Crawford develops his manifesto supported by his own personal experiences as a mechanic and electrician. As Crawford brilliantly proclaims ‘you can’t hammer a nail over the internet’. In a similar vein, Dr. Cal Newport’s book Deep Work: Rules for Focused Success in a Distracted World promotes Deep Work as the ‘ability to focus without distraction on a cognitively demanding task … and provide a sense of true fulfillment that comes from craftsmanship’. This book offers practical skills and a training regime on how to turn off the modern-day affliction of distraction (due to heightened technological connection) and to focus on the power of a deep concentrated work. Liam Broderick’s work as a thatcher wholeheartedly taps into the very ideals that these schools of thought are promoting. Liam describes how he ‘loves going to work’ elaborating on how the work ‘keeps him very grounded, close to nature and surrounded by natural materials. The first few hours of the morning can be a lovely time to work with only birdsong for company. The thatcher’s life is very satisfying’. 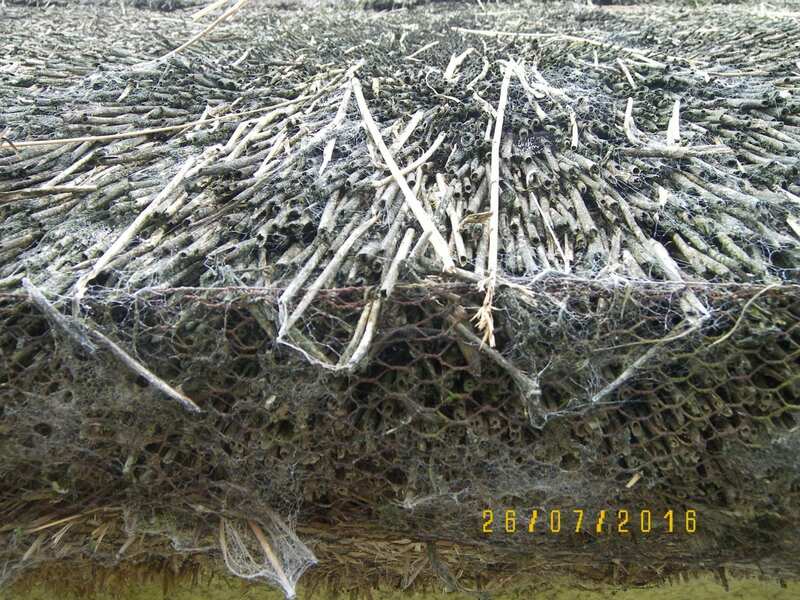 Liam outlines how thatching requires ‘an intense focus, an ability for complete engrossment and a very skilled eye to manage the lines. It may sound strange but the job is not as physically demanding as it is mentally exhausting. A thatcher has to be so focused. 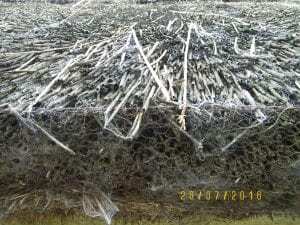 Thatching can be likened to a game of chess, a series of moves but if you make one mistake everything can go wrong’. Liam’s personal happiness and contentment with his position certainly support the theories advocating a return to practical work and ensuring a level of deep concentration in the jobs we do. However, it would seem the theories of Deep Work and The Case for Working with your Hands have not yet filtered down to Irish job seekers. Liam points out how there is no new generation of thatcher learning the skills of this craft and that thatching is effectively a dying trade. Liam has contact from employment agencies every year looking to place students on work experience. He points to a generational challenge where the old crafts and historic trades hold little interest for the younger generation. ‘Their interest is not with fixing motorbikes or lawn mowers. Nowadays, people are taught to replace rather than fix’. Liam’s worry is that ‘in as little as ten years thatching will be a trade of the past’. When Liam is thatching he explains how he has to put his mobile phone away for the hours he works. He was finding it very irritating receiving phone calls and texts, with each interruption creating a negative break in his own work system, coupled by a recuperation period of as much as twenty minutes to rediscover his flow. In a lovely way, Liam’s personal work methodology mirrors Irish Landmark Trust’s philosophy, where a stay in one of our properties is an opportunity to take a break from technology and return to the natural joys of life. It feels very fitting that the man charged with bringing life back into the old roof in The Mall sets a mindful and connected atmosphere even at the very earliest inception of this restoration project.